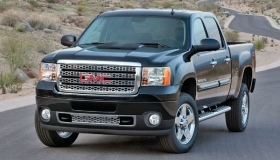 The 2011 GMC Sierra will arrive in July; 2010s showed up last October. DETROIT -- General Motors Co., seeking to cut heavy incentives on full-sized pickups, plans to change the model year of the vehicles in July, three months earlier than last year. Delayed by bankruptcy last year, GM made its pickup model year switch in October, compared with Ford Motor Co.'s August switch. So for months last fall, GM was selling 2009 models while Ford was selling 2010 F-150s. The result: "You end up having to incentivize much deeper," says John Schwegman, U.S. marketing vice president for Buick-GMC. "Sometimes you can grow share that way, but you do it much less profitably." GM piled on incentives. For instance, this month the company says it's offering $4,500 off light-duty, regular-cab Chevrolet Silverados and GMC Sierras. But later this year, GM will be able to decrease incentive levels on 2010s, Schwegman says. Those spiffs have room to drop: From August -- GM's first full month out of bankruptcy -- through April, the light-duty Silverado and Sierra averaged more than $4,600 in incentives, according to Edmunds.com. The F-150 averaged $3,656. Meanwhile, Ford will wait until November to switch model years on the F-150, according to data from the fleet management company Donlen Corp. The F-150 is scheduled to offer a V-6 EcoBoost engine and is expected to get a re-engineered V-8. But the automaker won't change its incentive strategy, Ford sales analyst George Pipas says, despite coming late to the 2011 light-duty pickup party. "We're going to do what we always do, which is align production with demand," he says. Schwegman says GM also plans to correct another problem from 2009 that led to higher incentives: While 2009s made up a third of GM's pickup inventory at year end, he says, GM may have "little to no" 2010s by this year's end.